In 2006 construction began on a training area on a vacant lot behind Station 80 in Juniata. Money was available through a very generous donation and from money raised through fundraisers. All work was done by fire-fighters and labor and materials donated from various patrons. The heart of the facility is the drill tower. It rises 30+ feet above the center and is used for various training scenarios. It is divided into three levels. Level 1 is known as the R.I.T. level and has two removable steel mesh doors that can simulate the hole in a floor needed to rescue a fire-fighter down in a basement. It also has a window that can be used for laddering to a second floor to rescue a victim, practice with hose lines off a ladder, etc. 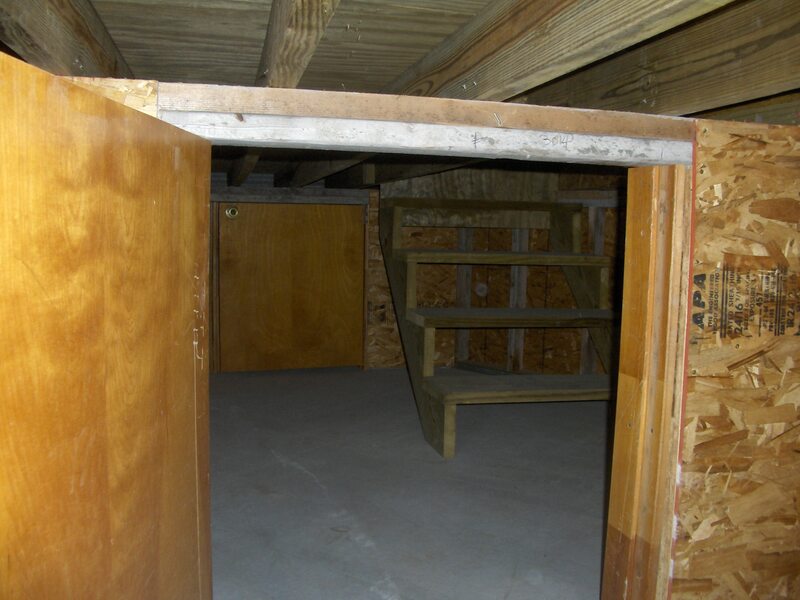 The second level, known as the pick-off level has window in which a victim can sit waiting to be “picked off” by a rope rescue. This level also has anchors that allow set up of “trolley or tralfar” lines running to anchors on the ground. The top level is the rappel level and is used for high angle rope rescue techniques. The solid walls can be used to rappel and pick-off. The open end is used for “Austrailian inverts”, ascents, changeovers, or for high angle lowering or hauls. Two ground anchors allow trolley lines from here too. A 14’0″ by 24’0″ concrete pad allows a vehicle to be placed for practice in stabilization and extrication practice. 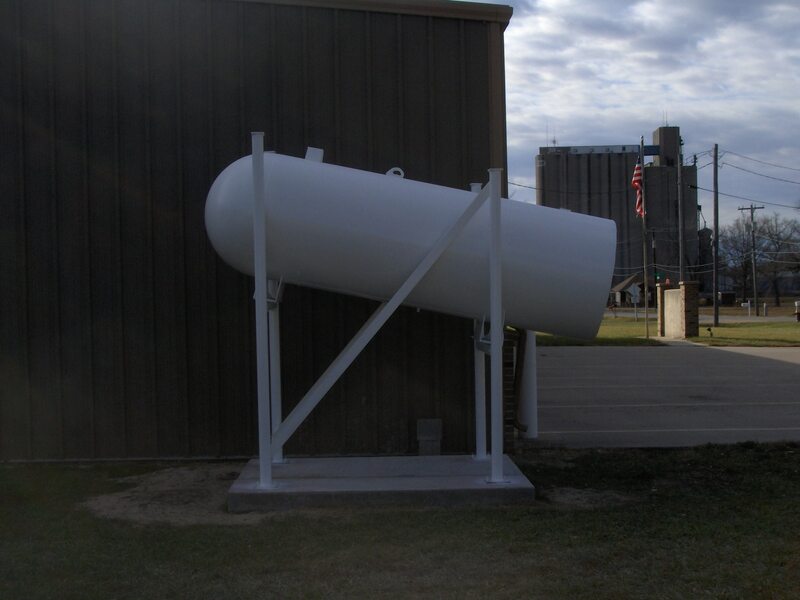 A 500 gallon propane simulator sits in one corner and offers practice for either propane or anhydrous scenarios, and can be set up to burn propane from an auxillary tank. (no product is stored in the tank). It does not put out alot of flame and heat but works well to practice the 5 man attack team tactic. Three safety valves are incorporated into the system. A small observation platform allows viewers to watch from above and also holds one of the three safety valves for the propane simulator. A small ramp can be attached to allow new rappelers the opportunity to practice with small angle rappels before they go off the tower. A combination burn/flammable liquids pit can be used to light fires for practice with hose lines or fire extinguishers. The stock tank is removed for this practice. 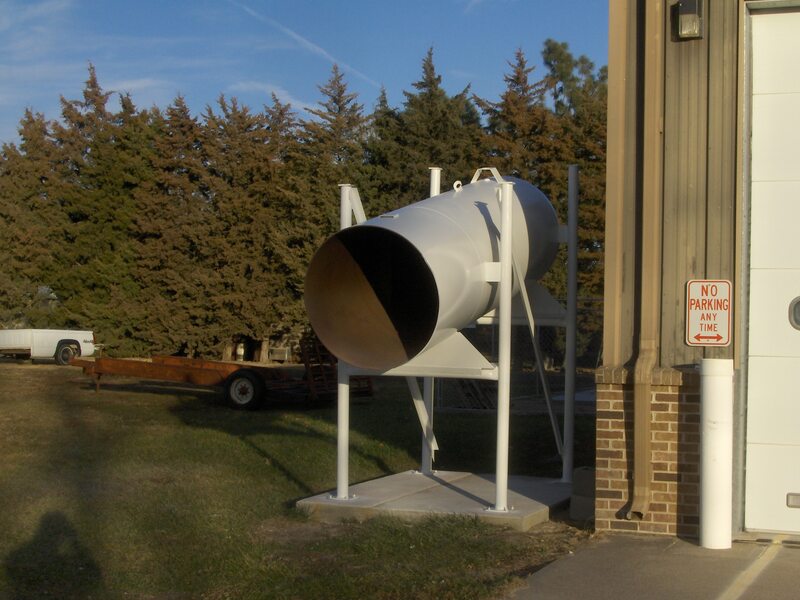 The stock tank can be replaced into the form and then almost filled with water and diesel poured on top to practice flammable liquid fire using foam extinguishers or lines. This allows for safe and proper disposal of the liquid when done. The grain bin allows us to practice cutting bins for extrication in grain bin rescues. 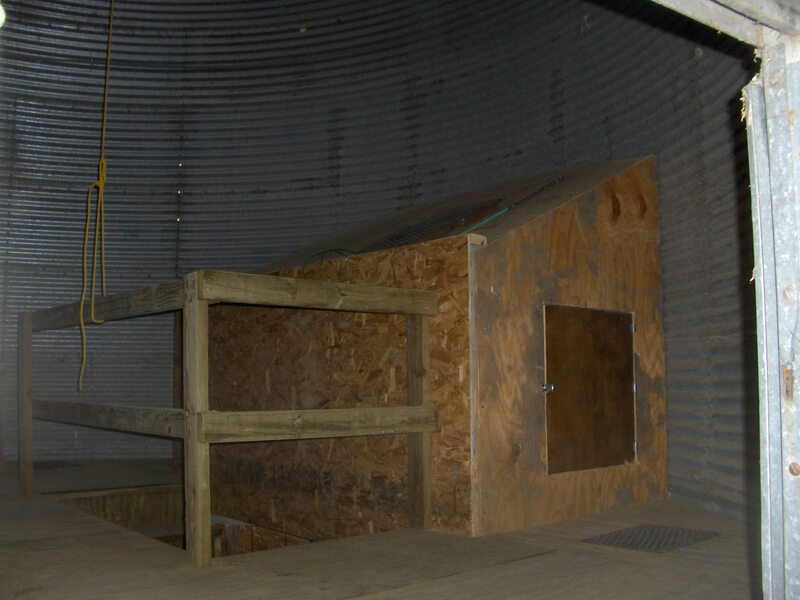 We can enter the scuttle from above to practice grain bin rescues. Inside an SCBA maze allows us to practice interior rescue revolutions and includes steps that lead to an upper floor, an attic simulator, and doors that can be opened and closed behind the interior team. Entrapments are added for self rescue practice. To be added to the outside is a removable fireplace chamber so that interior teams can look for the seat of the fire and then extinguish it. 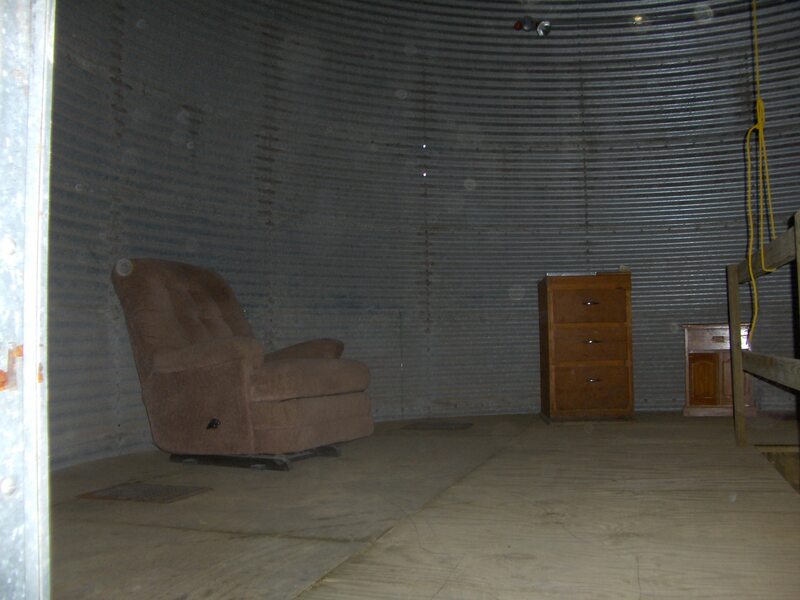 Furniture can be placed for victim search. A Rescue Randy is in place for that purpose. A smoke machine will be added so the facility can be used to practice positive pressure ventilation. The whole area is fenced in by a 6’0″ chain link fence. The whole project to date has cost about $12,000. The meeting room was remodeled and dry erase boards were added for instruction. A T.V., VCR, DVD, and a computer projector and screen were added.